Armoured tanks and security operatives were on Thursday morning, seen packed at the Lagos High Court in the Ikeja area of Lagos, as notorious kidnapper, Evans arrives in court for his trial. 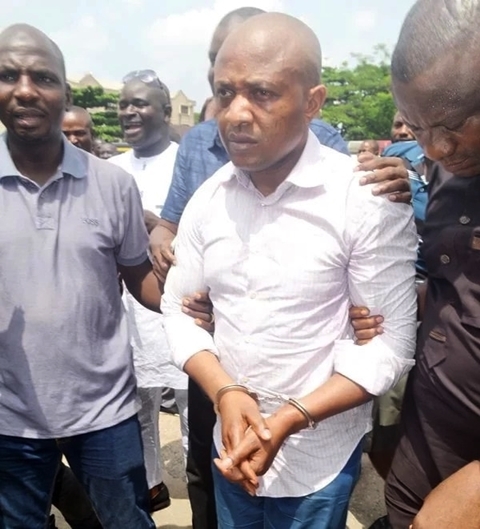 All appears set for the continuation of trial of billionaire kidnapper, Chukwudumeme Onwuamadike, popularly called Evans at Lagos High Court, Ikeja, Lagos, on Thursday. According to Daily Sun, Evans and five others were brought to court this morning in hand-cuffs. Though, unlike the day of his arraignment when heavy security men were highly visible within and around the court premises, only two armoured tanks were packed, each, at the two entrances to the court. Policemen were also stationed in various corners leading to Justice Oshodi’s court where the trial will take place.